Join us in congratulating Jane S. Richardson! 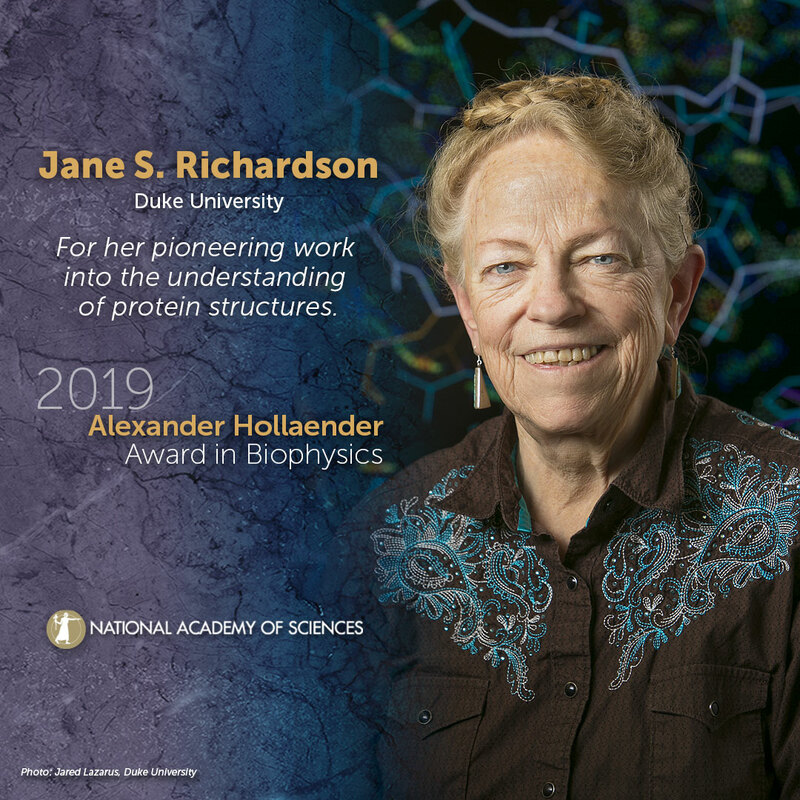 Jane S. Richardson, Duke University, will receive the 2019 Alexander Hollaender Award in Biophysics. For more than 50 years, Richardson has made innovative contributions to our understanding of biological macromolecular structures, solving one of the first dozen protein crystal structures in the 1960’s. Her 1981 article “The anatomy and taxonomy of protein structures” provided deep, fundamental insight into how proteins are structured and put together. It is still being cited, now 4,000 times. That article introduced easily understandable ribbon diagrams of protein 3D structures, often known as Richardson diagrams. More recently, the Richardson laboratory—jointly run by Jane and her husband David—has developed new approaches for validation of protein structures using the revolutionary “MolProbity” method, which examines how hydrogen atoms are packed in a structure to determine structure quality and is now used by thousands of researchers around the world. The Richardsons analyze and validate RNA as well as protein structures, and now cryoEM as well as crystal structures. The Alexander Hollaender Award in Biophysics is presented every three years and carries with it a $20,000 prize. The Award recognizes outstanding contributions made to the field of biophysics. Henrietta W. Hollaender established the Alexander Hollaender Award in Biophysics in honor of her husband, Alexander W. Hollaender, who brought to prominence the field of photobiology. Please use the following sample social media posts and other materials to congratulate Jane S. Richardson.